Hermes uses Zookeeper as metadata store. It does not have to be the same Zookeeper as the one used by Kafka. 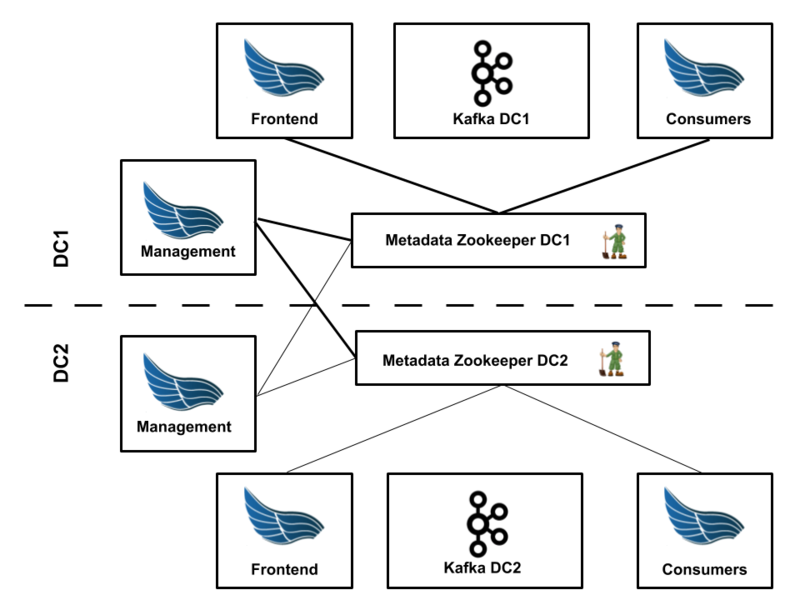 There should be only one Zookeeper cluster in use by all Hermes modules: Frontend, Consumers and Management. In simple case, Hermes is connected to just one Kafka cluster. Frontend and Consumers connect to Kafka to publish and pull messages. Management connects to Kafka to manage existing topics and initiate retransmissions. Zookeeper connection specific options (retries etc) are read from Metadata Zookeeper options. Hermes can be configured to publish and read messages to/from multiple Kafka clusters. We use this feature on production environment where we have separated kafka clusters in different data centers. If Kafka in one DC fails, whole traffic can be routed to the second DC. This scenario assumes, that Kafka clusters hold different set of messages. There is no support for multiple clusters each holding the same copy of data. Configuring Frontend and Consumers is easy: use configuration options from previous chapter to connect to given clusters. Remember about specifying proper kafka.cluster.name.